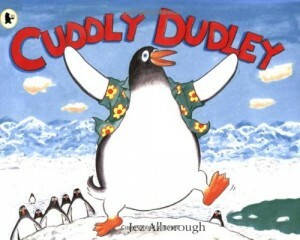 The Story: Cuddly Dudley is a penguin who likes to do things by himself. However, his brothers and sisters find him so adorable that they just want to hug him. One day he finds a little hut that is a perfect sanctuary for a penguin. When his brothers and sisters follow him he sends them away but then the man who lives in the hut comes back and wants to hug Cuddly Dudley too! Cuddly Dudley escapes and finds his brothers and sisters but then their group hug is interrupted by the man from the hut who also wants to join in! It is understandable why everybody wants to hug Cuddly Dudley, he looks very cute in his Hawaiian shirt and sunglasses! I love the comic strip layout of this story and the conversational tone of the text which is also good for a beginner reader. Jez Alborough has used a variety of layouts for the illustrations, some pages have several small frames and others have full page spreads. The pictures are very funny and it takes us a while to get through the book as my daughter pores over all the little details in the hut and she loves to count all of Cuddly Dudley’s brothers and sisters (which takes a while as there are a lot!). Family love and loyalty is paramount in this story, even though Cuddly Dudley turns his back on his family to have time alone they are there for him when he needs their help. We love this beautifully illustrated, humorous story about family and sibling support. It is a lovely, gentle story that is great for bedtime. 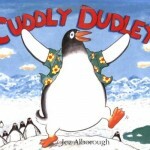 Thanks for the Cuddly Dudley review, glad you enjoyed it. You might want to check out my latest book NAT THE CAT’S SUNNY SMILE which is all about sharing happiness.